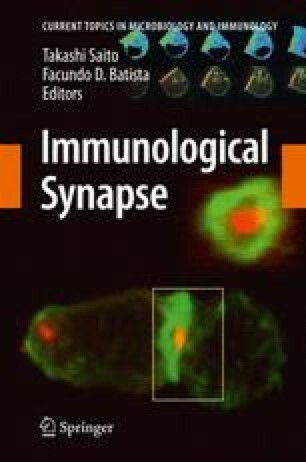 The immunological synapse is a dynamic structure, formed between a T cell and one or more antigen-presenting cells, characterized by lipid and protein segregation, signaling compartmentalization, and bidirectional information exchange through soluble and membrane-bound transmitters. In addition, the immunological synapse is the site where signals delivered by the T-cell receptors, adhesion molecules, as well as costimulatory and coinhibitory receptors are decoded and integrated. Signaling modulation and tunable activation thresholds allow T cells to interpret the context in which the antigen is presented, recognize infectious stimuli, and finally decide between activation and tolerance. In this review, we discuss some strategies used by membrane receptors to tune activation signals in T cells. A.V. is supported by the Italian Association for Cancer Research (AIRC); Telethon; Ministero dell’Università e della Ricerca (MIUR); Istituto Superiore di Sanità; Alleanza Contro il Cancro; the DoD Army Medical Research, USA; the Cancer Research Institute of New York; the EMBO Young Investigator Program; E-rare 2007; EC FP7 HEALTH-F4-2008-201106.